Moscow: CSKA stadium finally ready! During today’s tour of the construction site, deputy mayor Marat Khusnullin officially confirmed that the CSKA Stadium has been completed. There is still equipment and furnishing work to follow and safety assessments need to be made. But within a month from now, by late August, the building should be cleared for opening. Today’s revelation ends an extremely problematic project, one of the most troubled among Russian stadia. Demolition of the old army stadium was carried out back in 2006, while official groundbreaking of this new one followed on May 19, 2007! Its initial delivery date was set for 2009, then postponed until May 2010, summer of 2013, spring of 2015 and finally summer of 2016. 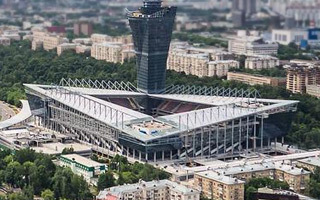 It was expected to host the Russian Super Cup game this summer, but the event had to be relocated. Now the first games are expected in September, though the newly created CSKA subway station won’t be opened until December. There is more than one reason for these stunning delays. Possibly the largest one was land dispute between CSKA and the Russian ministry of defense. When approved, the stadium was to be built on federal land, which later had to be bought by CSKA for roughly RUB 1 billion, after a court settlement. Project documentation has also undergone serious changes, while the stadium’s budget has inflated to over triple the initial estimates! Back in 2007 it was announced to cost $100 million, while the final figure should be within $300-340 million. The stadium comprises stands for 30,000 people (including a huge number of 127 private boxes), an impressive office tower rising to 142 meters, a hotel and numerous other facilities, including 1,400 parking spaces. Aside from becoming the newest Premier Liga venue, it will also be a training center for the 2018 World Cup.